After I took the images in the Lens section, I realized their parallel to this past week’s election. These portraits of the autumn blooming zinnia has given all of themselves to a season that skipped the zigzag of warm to cool and cool to warm. Instead we’ve had a swing to winter-like weather. Yesterday, high winds brought the temps to low 40s, truly atypical. These last flowers of summer and autumn had to depend on the sun for survival. The endurance of these tiny zinnias reminded me of many voters: resilient, steadfast and determined. The mission was cast and realized. Democracy prevails with hope for a return to civility and a moral compass. Today also is brighter for the planet. This past week the court’s voted on the side of the environment (turning down the administration’s push for the Keystone Pipeline), thanks to the huge dedication of environmentalists and advocates. Truly, nature and human nature share a bond of persistence for the greater good. Vigilance is still needed as is hard work over the next two years. But it is sunnier than it has been in two years. The discovery of artist and writer Rupi Kaur’s poetry’s has provided a place of quiet contemplation and pleasure. Her words are deeply emotional and poignant. Here is a sample. Kaur came into prominence with her first book, Milk and Honey (2014). The Sun and Her Flowers adds to the themes that initially brought her fame: femininity, love, self-loss, healing, and survival. 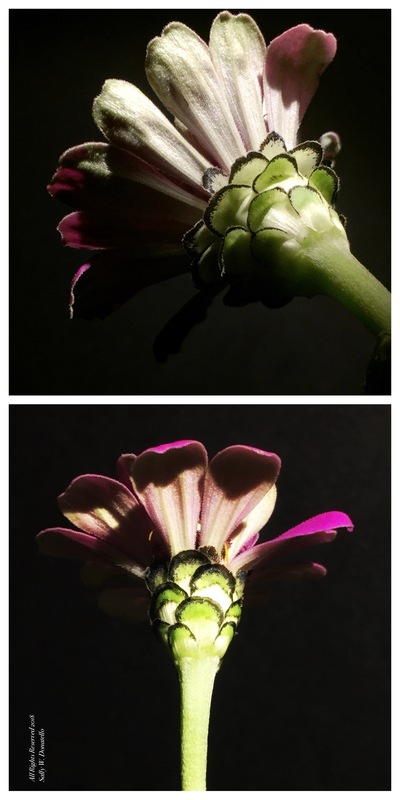 This entry was posted in Collage, Digital Art, Macro Photography, Mobile Photography, Nature, Photography, Poetry, Writing and tagged Collage, Digital Art, Mobile Photography, Nature Photography, Photography, Poetry, Writing, Zinnias. Bookmark the permalink. Tina, I’m humbled. Best wishes for a memorable and peaceful Thanksgiving. I love the beauty in your lens section and agree fully with your pens section! There is hope. Tiny, and nature certainly is a huge part of that hope. Thanks. Beautiful photos Sally and I love that Rupi Kaur verse. Here’s to sunnier times for democracy around the world! Madhu, I appreciate your comment. Happy travels. I love this POV of the Zinnias, Sally. The detail of the bottoms of the leaves and the armored look of the next ones to sprout fascinate me. I am used to looking down at the ones on our hillside and they are a bit too far away when I am below them looking up. You have inspired me to find a way to appreciate the splendor above and below our flower friends. Allan, yes, one of the great surprises is viewing flowers and all of nature from various perspectives. Thanks so much. Let’s hope you are right and we see a return to civility and a moral compass. But we can never let down our guards, can we. Beautiful “portraits”, by the way. Otto, thanks for your response.